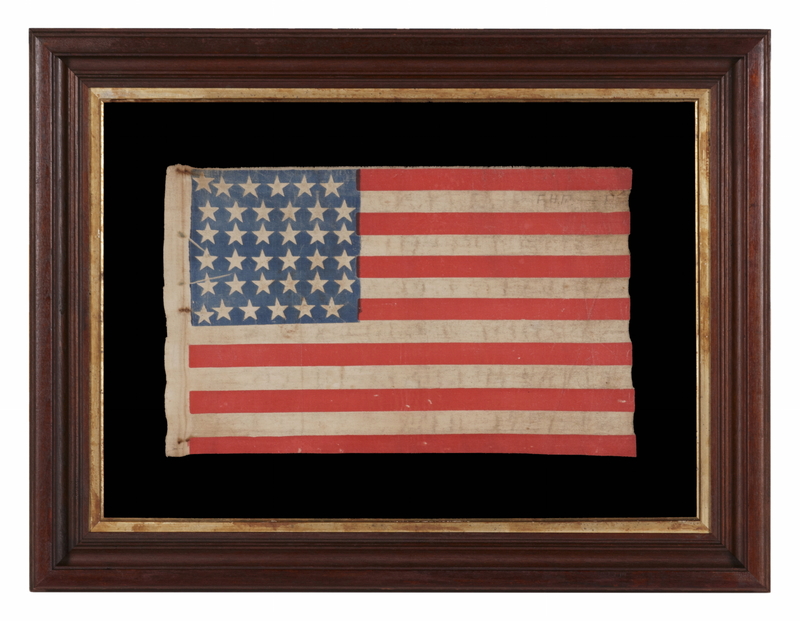 Frame Size (H x L): 22.25" x 29"
Flag Size (H x L): 11.5" x 18.25"
36 Star, Civil War era (1864-67) American parade flag, printed on cotton, with a lineal star configuration that is framed on three sides by a “U” for "Union". 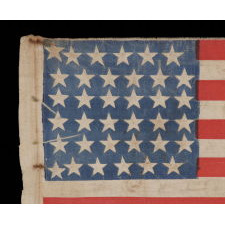 This is one of a highly interesting group of known flags that display such imagery that relays a subtle, Civil War message. 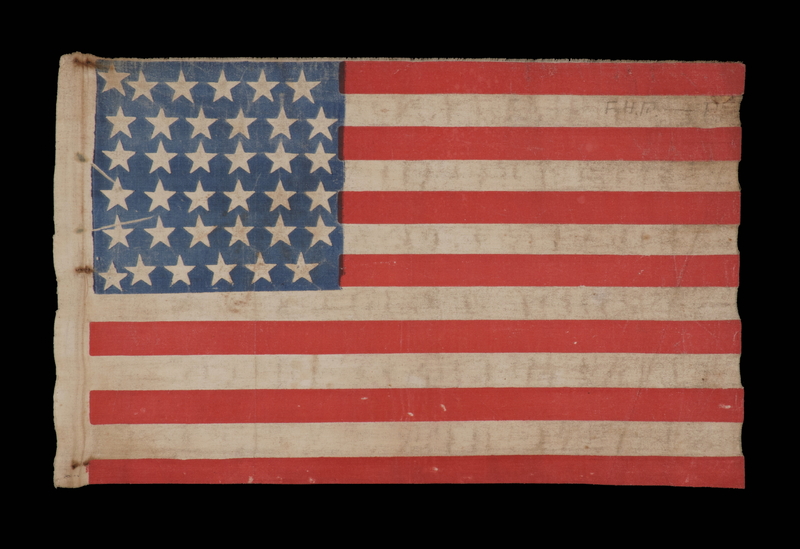 Similar designs are known in other star counts, including 34 and 13 stars (also Civil War period), but all are rare. This particular flag is one of a small handful of examples that I have encountered in this style. 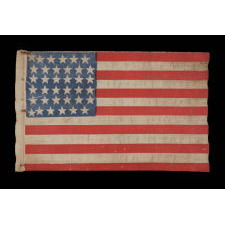 Interestingly enough, this flag—and other known styles in the 1860’s to 1870’s era—probably came about simply as modifications of an earlier arrangement of fewer stars. 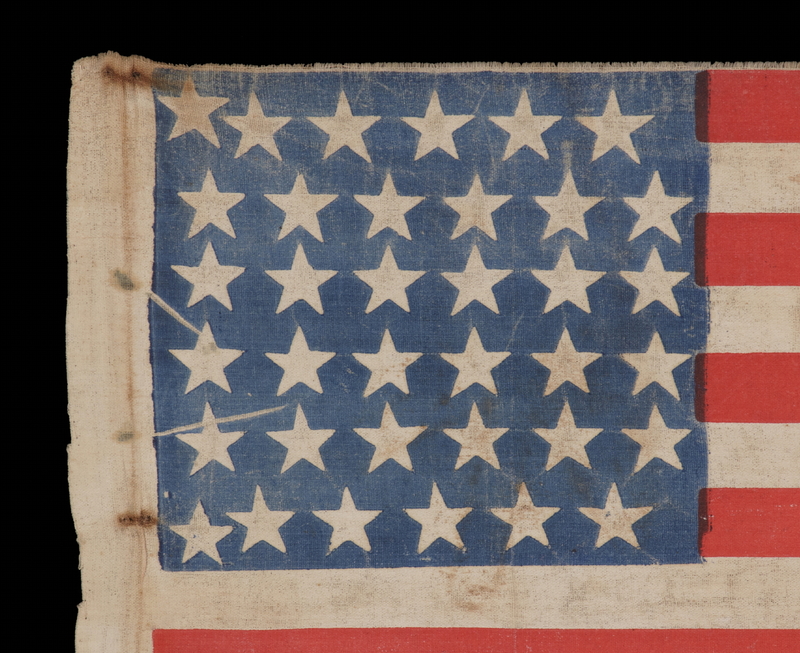 Parade flags such as this one were block-printed onto fabric, usually by way of a carved wooden pattern, sometimes overlain with leather or felt to absorb the pigment into which it was dipped. 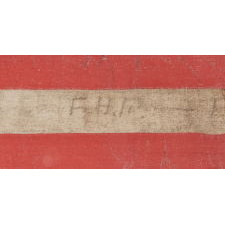 Because new states entered the Union at a rather fast pace, some flag-makers found it more practical to modify an existing print block than to make an entirely new one. In the case of this particular variety, two additional stars, located at the extreme upper and lower corners of the hoist end, were added to a previous carving of 34 stars in relief, so that no pigment would adhere in these areas and the design would be updated to 36 stars. So the reason for making the pattern had a practical purpose first and perhaps symbolic purpose second. This star pattern is also closely related to a group of known configurations that depict what I have termed a "beehive". The design can be seen in this instance if the flag is rotated counterclockwise 90 degrees. A common Masonic symbol, the beehive represents hard work and industry and is frequently encountered in fraternal objects. 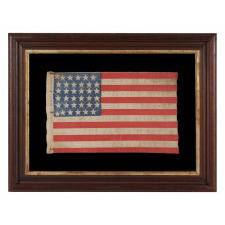 It is also seen in early America on paper currency and printed ephemera, as well as state and federal seals and patriotic textiles. It was a seeming accurate representation of colonists' ideals and likewise supported the notion that if united together, the colonies could accomplish more than they could as individual entities. If rotated 90 degrees counterclockwise, this lineal arrangement along forms the "U" for "Union". 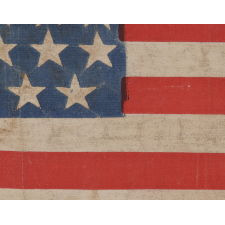 Though rare in antique American flags, this configuration seems to have been intentional in a handful of Civil War and post-war flags, at a time where lots of symbolism was woven into the design of the Stars & Stripes by passionate Americans who had liberty to do what they wished with flag design. 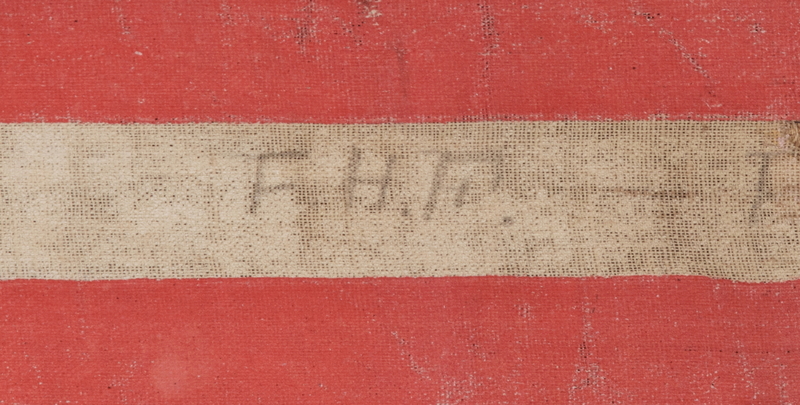 It is of interest to note that the white fabric used to create this particular style of parade flag was printed first with white pigment, probably so it was whiter then the cotton and so that the blue and red pigments would adhere better. 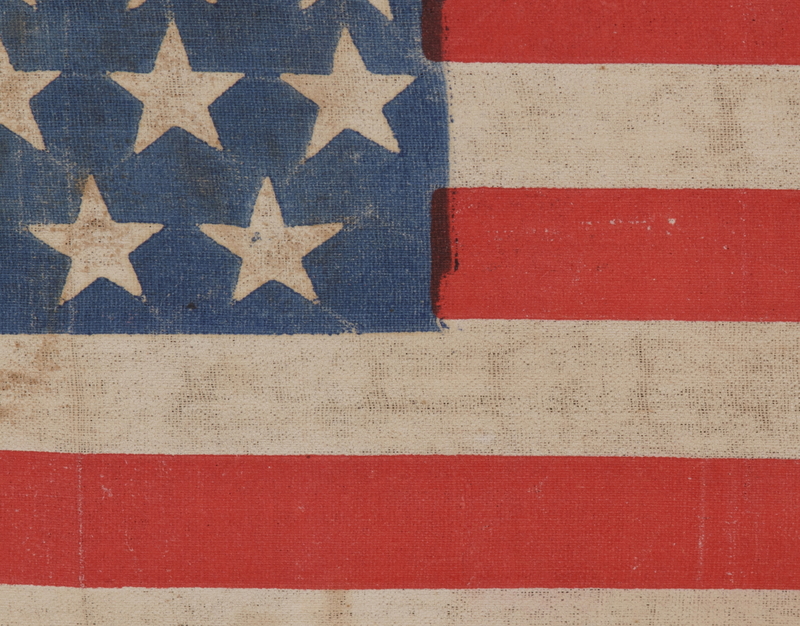 This variety was also printed on both sides, while almost all others were printed on one side only, so that the color bled through to the other side to create a two-sided flag. 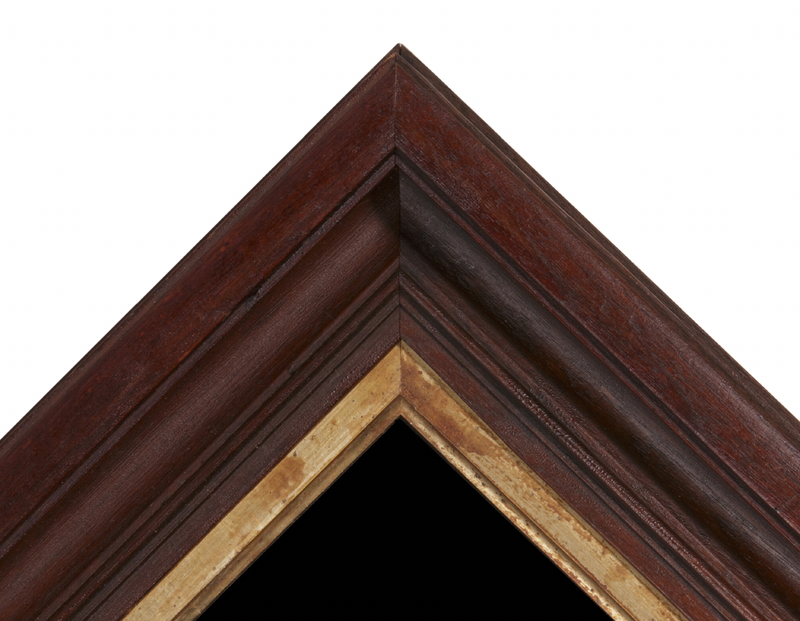 The solid walnut frame dates to the period between 1860 and 1870, and so is period to the flag. 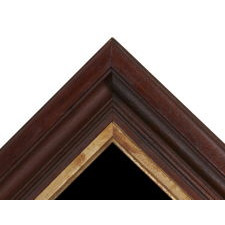 It has a very attractive profile, original surface, amd retains its original gilded liner. The background is 100% cotton twill, black in color. The glazing is U.V. protective.